Please sear the image in to your memory so that you recognize it when you stroll into a book store. Assuming book stores still exist when the book comes out. Speaking of: It will come out in June 2011. Or July 2011. Or August 2011. It’s hard to say. Every time I ask someone I get a different answer. The good money seems to be on July. Let’s just say July. As you can see, it is called The B.S. 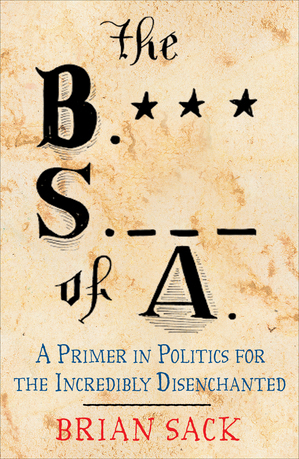 of A: A Primer in Politics for the Incredibly Disenchanted. The assumption is you are among the incredibly disenchanted. Like my last book is a humor book. Unlike my last book, which was ostensibly directed at my son, it is ostensibly directed at everyone. It’s about politics, as the title suggests, and I tend to poke fun at a lot of things. There’s a good chance I poke fun at some thing or politician you like. I hope that doesn’t make you mad. It’s all for the greater good of being as objective and non-partisan as possible, which is what we’re sorely lacking these days.